Menopausal hot flashes can lead to excessive sweating more than you can ever imagine. The fact about this situation is that it can be quite uncontrollable and at the same time embarrassing. Having this as a problem, the big question should be, how can you control it? Just like every other menopause symptoms, hot flashes and sweating can be traced back to an hormonal imbalance. In combating this issue, the best thing to do is to tackle the root cause of the problem. For you to have a better understanding on how to fix the problem, let us first of all look at what exactly causes it. Hot flashes can usually be described as a sensation of intense heat in the upper body, followed by a increased heartbeat and a redness of the chest, neck and face. 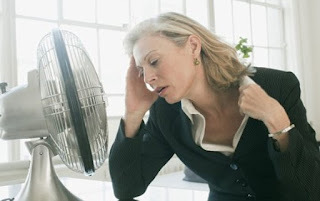 What Causes Excessive Sweating During A Hot Flash Episode? As mentioned above, it is usually due to hormone imbalances; More specifically, a decrease in estrogen. This happens because estrogen has a big impact on the hypothalamus, which is responsible for regulating temperature in the body. When estrogen levels drop, the hypothalamus causes the blood vessels to expand in order to release heat from the body. This causes the sudden feeling of heat, where after the body tries to cool itself down by triggering the sweat reaction. These episodes may come and go for as little as a few months, and up to several years. It is best to try and minimize their effect and occurrence as soon as possible. Here are some tips to help you cope. Avoid food-triggers like spicy food, alcohol, caffeine, and other common hot-flash inducers. Keep your bedroom cool with a fan or an air conditioner. If you are a smoker, kindly quit. Lose some weight to help you keep cool. Use herbal remedies, to increase estrogen levels the natural way. Are you a woman who have approached the age of menopause? If your answer is yes, you can simply follow this tips to minimize excessive sweating. Kindly share this information with your friends and loved ones by using any of the social share icon below.